Handling your cockatoo is an essential part of interacting with him. Cockatoos are friendly parrots who can live 50 years or longer. Knowing how to handle your cockatoo properly is absolutely essential to being able to care for your bird and enjoy him. Being able to pet your cockatoo is the first step in being able to handle him. 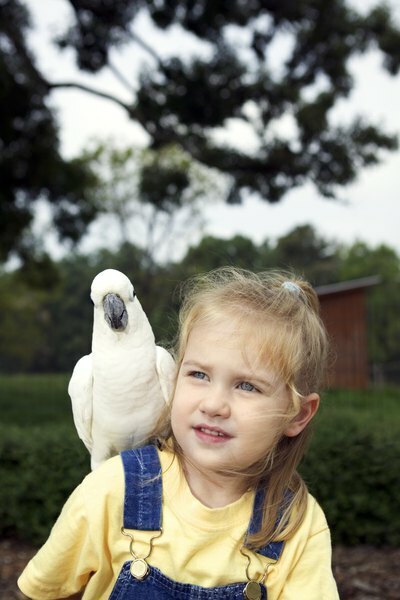 Approach your cockatoo's cage very slowly while speaking softly and calmly to the bird. Allow your bird to see you and hear you coming. Avoid making loud or threatening noises. Repeat the approaching process as necessary until your bird accepts you approaching his cage without trying to avoid you or retreating away from you within the confines of the cage. Teach your cockatoo to accept the presence of your hand by offering him treats through the bars of the cage. Hand-feed your bird treats on a regular basis until he comes to your hand and takes the treat willingly. Open the cage and begin offering your cockatoo treats from your hand within the cage until he also accepts the presence of your hand in his cage and approaches your hand willingly. Hold out your hand inside the cage and allow your cockatoo to begin climbing onto you hand. Gently pet your cockatoo, always petting along with the grain of his feathers rather than ruffling them. Give your cockatoo a treat as a reward for accepting your handling and petting so that he associates contact with you as a positive occurrence in his daily life. Never punish your cockatoo, hit him or yell at him. Cockatoos are very intelligent and have very long lifespans; any damage you do to your relationship with your bird will take a long time to undo. Never force your cockatoo to be petted; he should come to you willingly for affection. What Causes Dogs to Become Clingy?